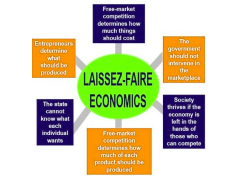 Quick Definition: Laissez-faire is an economic system in which there is a competitive market economy where prices are determined by supply and demand and there is little or no intervention from the government. Laissez-faire literally translates from French to ‘leave to do’. 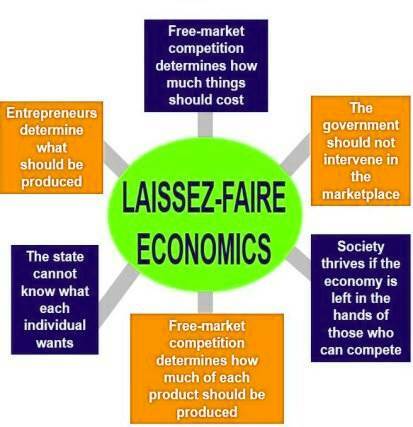 Laissez-faire is a type of economic system where the government doesn’t intervene in the economy. The price and quantity of goods and services produced in the economy are determined by private businesses and individuals, and the government has no involvement. A laissez-faire economic system doesn’t necessarily mean that the government has no role at all. Most followers of a laissez-faire economy still believe that a central government should set basic rules and enforce property rights in order for the free market system to function properly. There is no real life example of such an economic system today. Most countries have at least some degree of intervention in the economy, with governments providing basic public services such as education, healthcare and transport. Invisible hand – An expression coined by the economist Adam Smith which was used as an analogy to show that when people acted selfishly and bought products that they wanted, society on the whole would be better off because only the goods and services that people wanted would be produced as firms would only produce goods that are profitable. Market – Any medium through which buyers and sellers reach an agreement to trade.